But terrorism dressed as "civil war" likely. Vigilance and swift, decisive action against regime's leadership can stop it. January 4, 2014 (Tony Cartalucci) - The embattled regime of Thailand's Thaksin Shinawatra and his substantial Western backers are attempting to hold peace, stability, and the nation's future hostage in order to extort from Thailand the perpetuation of their current grip on power. Chief among their threats is the myth of an impending "civil war." Unfortunately for them, and despite their best efforts, in order to have a "civil war," you must first have a divided nation. Thailand is by no means divided, and now more than ever what little support the regime had is slipping away - which is precisely why attempts to finally uproot Thaksin for good are being made now. The voice on the radio is calm, its message anything but. Throughout the propaganda piece, nothing in the line of evidence is offered aside from one unqualified anecdote after another. The Globe and Mail also peddles the entirely discredited "class divide" myth spun by others across the Western media, including Reuters, the BBC, the Wall Street Journal, and the New York Times - again offering nothing in the line of facts, figures, or statistics to backup its dubiously sensational narrative. 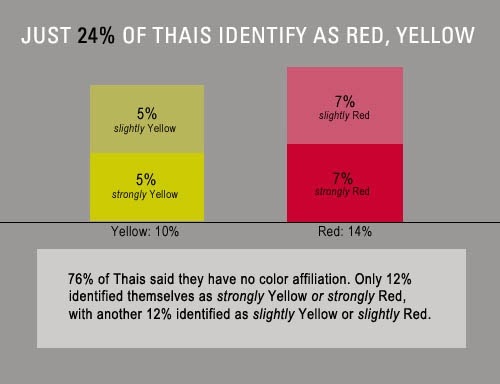 "Since Thailand’s color politics began pitting the People’s Alliance for Democracy’s (PAD) “Yellow-Shirt” movement against the National United Front of Democracy Against Dictatorship’s (UDD) “Red-Shirt” movement, political watchers have insisted that the Thai people are bitterly divided in their loyalties to rival political factions." 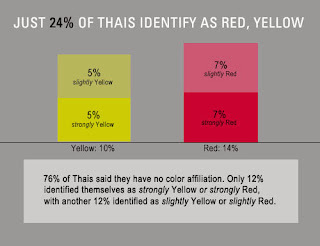 The survey, conducted over the course of late 2010 and involving 1,500 individuals, revealed however, a meager 7% of Thailand's population identified themselves as being "red" Thaksin supporters, with another 7% identifying themselves only as "leaning toward red." 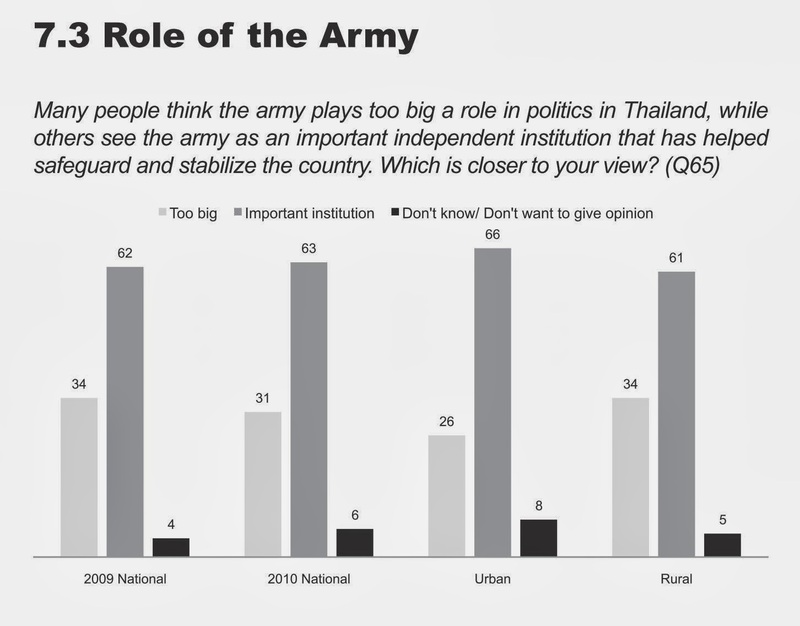 Worse yet for Thaksin Shianwatra and his foreign backers, the survey would also reveal that many more Thais (62%) believed the Thai military, who ousted Thaksin Shinawatra from power in 2006 in a bloodless coup, and who put down two pro-Thaksin insurrections in 2009 and 2010, was an important independent institution that has helped safeguard and stabilize the country. Graph: Up from 62% the year before, the public perception of the military as an important independent institution stood at 63%. Even in in the regime's rural strongholds, support stood at 61%. The only individually polled group that did show majority support for the military, was the regime's tiny "red" minority, but even among them, 30% still supported the army. 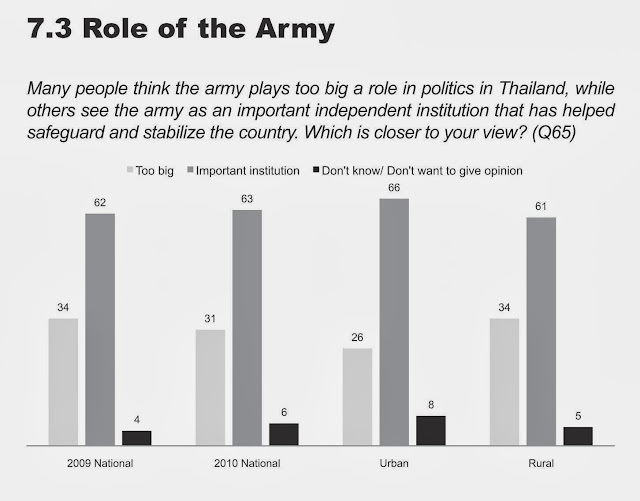 For Thaksin Shinawatra and his proxy regime, it has only lost support since the 2010 survey was conducted. In the 2011 elections, despite being declared a "landslide victory," according to Thailand's Election Commission, Thaksin Shinawatra's proxy political party received 15.7 million votes out of the estimated 32.5 million voter turnout (turnout of approx. 74%). This gave Thaksin's proxy party a mere 48% of those who cast their votes on July 3rd (not even half), and out of all eligible voters, only a 35% mandate to actually "lead" the country. Since taking office, it has bankrupted a disastrous vote-buying rice subsidy and has subsequently failed to pay rice farmers, fumbled its response twice during catastrophic flooding in 2011 and again just this year - all while spending the vast majority of its time consolidating its power and attempting to exonerate Thaksin Shinawatra of his many crimes. Conversely, it was the Royal Thai Army that came to the aid of the rural countryside when flooding hit, and assisted in both rescue and logistics during the floods, as well as cleaning up afterwards. Not only do the facts paint a picture in sharp contrast to the "divided Thailand" narrative, but operational considerations also completely dispel the myth of a pending "civil war." The number of armed supporters Thaksin could possess in Thailand to actually fight a "civil war" are minimal. Of the 10,000-30,000 supporters he is able to mobilize with cash payments and bus services at any given time, only about 1,000 could be considered fanatical, and out of that, fewer still who are of military age, willing, and physically able to take up arms against Thaksin's enemies. Thaksin had clearly augmented this with professional mercenaries, drawn from paramilitary border units in the north and northeast, but these numbered only about 300 and were easily outmatched by the Thai military in 2010. Thaksin's grip on the nation's police forces allows him to produce on demand thousands from across his north and northeast political stronghold, but even if these police were armed, they lack the training, organizational skills, and coordination to pose any threat to the nation's armed forces. They have proven in recent weeks to be completely ineffectual (and in some cases unwilling) against even unarmed protesters. The real threat would be an influx of Cambodian mercenaries, trained, armed, and directed from Cambodia, and sent into Thailand covertly to be staged and deployed at key points during Thaksin's continued bid to cling to power. These could be used to augment police and small units of fanatics drawn from Thaksin's "red shirt" mob, or in individual operations aimed at various elements of the opposition. However, unlike in Syria, Thailand commands tactical, strategic, economic, and numerical superiority over Cambodia. There are few if any regional mechanisms that would protect the regime in Cambodia from retaliation by Thailand should violence break out and Hun Sen found complicit in supplying mercenaries and/or material support. The Thai "civil war" Western analysts have long been predicting with poorly masked enthusiasm, would most likely only materialize using the "Syrian-model" of covert invasion combined with a coordinated propaganda campaign already being carried out by the Western media. Instead of Jordan, Lebanon, Turkey, and northern Iraq feeding militants into Syria, this new war would consist of Cambodia feeding militants and material in through northeast Thailand, with the resulting conflict appearing to be between "Thaksin's political stronghold" there and the rest of the country. However, the best Thaksin Shinawatra and his backers could hope to achieve in the wake of their eventual ousting from Thailand's political landscape is wide-scale terrorism, not all out "war." Such violence would only open the door to hard-lined Egypt-style purges of Thaksin's political allies and remaining financial assets inside the country, and the permanent exile of anyone in his regime smart enough to leave before the violence began. 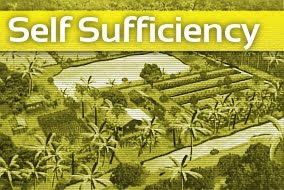 For Thaksin it would be a futile act of spite, but one the nation should be prepared for nonetheless. "Civil war" in Thailand is impossible. Thailand is not divided. If anything, now more than ever it is united in purpose against an increasingly destructive, perpetually self-serving regime that has long since overstayed its welcome. Thais of all kinds are eager to get back to the business of moving the nation forward and that the regime would threaten this desire with warnings of protracted "civil war," is but another reason it must be uprooted permanently from Thailand's political landscape.